You know that pistachio ice cream you get at Italian geleaterias? Disappointing huh? Never quite tastes how you want it to. I've been meaning to try making it for years. Last Wednesday night I finally got round to it. It is now my new favourite ice cream! There are 2 routes you can go down with ice cream - the custard based route or the Phildelphia style (without egg - not because it contains Philadelphia cheese) route. I much prefer the Philadelphia version for my events - saves so may problems with pregnant guests, who, although I would use pasteurised egg still are wary of eating it. Better safe than sorry! I use the Philadelphia ice cream recipe from the book (now fallen apart at the spine) that I got in '95 - the summer I'd finished A levels and tested many of the recipes during that summer with the fruit from our garden - Ices: The Definitive Guide. Take a basic Philadelphia style ice cream mix and add pistachios. Lots of them! I think that's where ice cream manufacturers go wrong - there's no point scrimping on the main ingredient! To make another type of ice cream you can miss out the pistachios and add something else using the same recipe - fruit puree for example or another of my favourites is a ginger version - add ginger wine (about 150 ml) and chopped stem ginger. Heat a small bit of the milk in a pan with the sugar till the sugar melts. No point putting all the milk in - just takes longer to cool down, so longer time till you can start making ice cream. Blitz the pistachios in your food processor. Pulse it first so the pistachio nuts are just crushed. Take away maybe 1/5 of these pulsed nuts to add in at the end. Then carry on blitzing the remaining nuts to infinity - or as long as you can manage. Eventually it turns into a paste like the above - a ball of nutty madness. Blend all the remaining ingredients + reserved pistachios together with the sugar/ milk mix and churn in the ice cream machine. If you don't have an ice cream machine there is a link to still freezing method here. FAQ How much ice cream for one portion? 500 ml ice cream does 8 scoops. 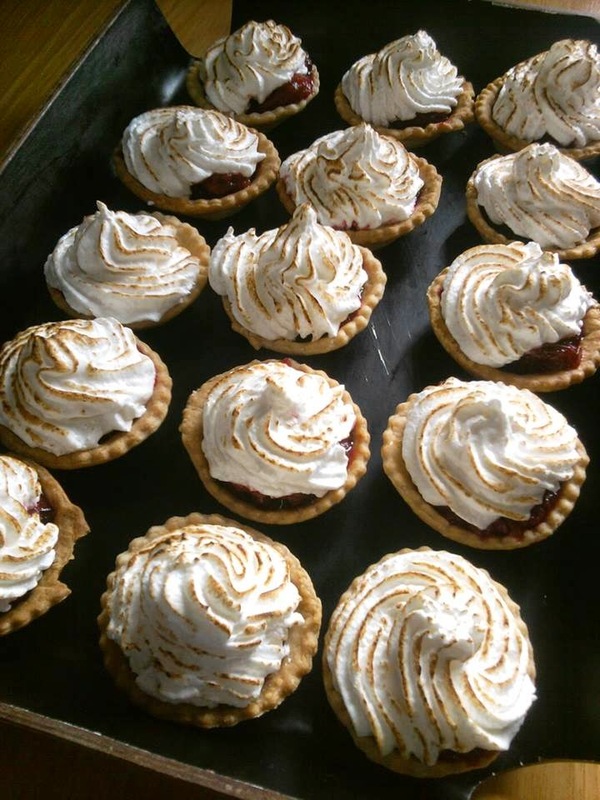 Mini plum meringue pie for a lunch buffet delivery the following day. Oh - you want a recipe for the plum meringue pie as well? Well no time - there's the weekend just gone to clear up from, washing up to do, emails to answer and a new week to organise. Vanilla poached plums mixed with a little bramley apple puree to thicken it. Actually I roasted them this time - same way you do with rhubarb. Italian meringue using this recipe. Pipe it on top & blow torch it/ bake it. If you bake it you can also heat up the plum filling. Pistachio nuts are not nuts. They're fruit.